If you wish to slow down fast, this is the cruise for you. 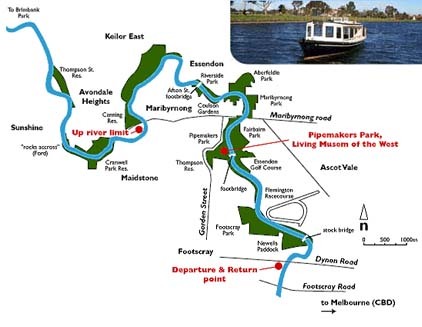 Enjoy the riverside scenery and an interesting commentary on the other side of Melbourne. Operates :- When Vessel is not on charter. Ring or e-mail for availability. Tuesday, Thursday, Saturday, and Sunday. (except Good Friday and Christmas Day). 1pm for two hours cruise. Heavenly Queen Temple. Footscray Park. Flemington Racecourse. Victoria University. Housing estates. Rowing & Canoe Clubs. Edgewater lake. Riverside Golf Course. Melbourne’s Living Museum of the West & Pipemakers Park. Highpoint Shopping Centre. Sporting Venues. Angler Tavern. Essendon Boulevard. Riverside park. Wetlands. The Old Sandpits. Tentative enquires can be made via phone, via e-mail or in person at the office.